Road Trail Run: Reebok Floatride Run Fast Pro Full Review: Amazing Substance, Minuscule 4 oz Weight! Best Race "Flat" Ever? Reebok Floatride Run Fast Pro Full Review: Amazing Substance, Minuscule 4 oz Weight! Best Race "Flat" Ever? The Reebok Floatride Fast Run Pro is an impossibly light (3.6 oz/102 g in my US M8.5 so sub 4 oz in a US M9) road racing flat with an atmospheric $250 price tag, more than $60 per ounce so literally caviar pricing! 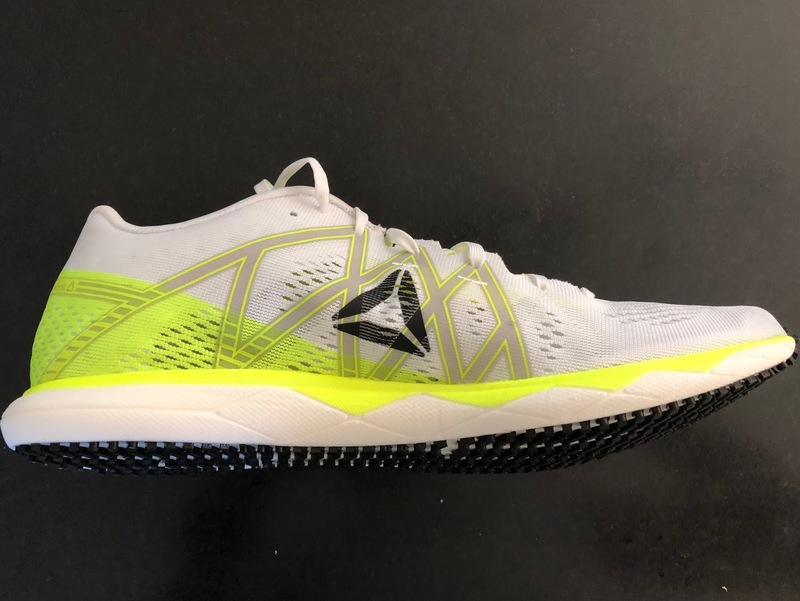 Sam: Designed for Reebok's elite athletes including their Zap Fitness team, this shoe took Nicole DiMercurio to a stellar 6th place at the Boston Marathon this year. I sure scratched my head hearing that news, Boston hills and all... Was there more to this shoe than meets the scale? In the day of the super cushioned Vapor Fly what was Reebok thinking here? Let's just say real, real good thoughts and superbly executed! As an older, now slower runner it had been ages since I enjoyed racing even a 5K to 10K race in a traditional flat having had not so great experiences in the New Balance 1600 and Nike Zoom Streak 6. Firm, harsh and unforgiving even for these shorter races I have stuck to adios Boost and VaporFly lately. With a 5K on my program, and after a 4 mile tune up I raced them. Closely related in construction to the fantastic Floatride Run Fast (RTR review), the Pro shares a PEBA(x) Floatride Foam midsole with a lime underfoot EVA stabilizing layer and a single layer engineered mesh upper which is yet lighter in the Pro and leaves out the Fast's partial bootie. They differ from the Fast having a 16.5mm heel / 12.5 mm forefoot stack so 1.5 mm less stack in the forefoot and 3.5mm less in the heel and a very significant 2.6 oz/74 g lower weight. Most significantly and probably a big factor in the $110 cost difference and the weight difference between the Fast and the Fast Pro, the Pro has a very unusual outsole of very small TPU harder plastic lugs which are injected (or co molded) directly into the midsole so no glue layer, no interruption in feel between midsole and outsole with a distinct impressions that each lug is a tiny piston acting independently or in small groups, truly. The lugs appear very durable. Derek: I would never have believed that a shoe of this weight could be this cushioned. I've tried many shoes weighing 2-3oz heavier that have harsher feels underfoot. I didn't really notice the bounce of the PEBA foam in the Floatride Run and the Run Fast as much, but I definitely felt it in this shoe, just walking around in it. The big drawback is the price point, and I think that may deter people somewhat. If they had priced it at $140 like the Run Fast, I think this shoe would have flown off the shelves like the Vaporfly. Michael: The Fast Pro is my sort of shoe, from the get-go. No fancy carbon-fiber shank or guarantees of grandeur, but rather a really, really lightweight shoe with a snug, breathable fit, decent outsole, and just enough cushion underfoot to get you to the finish line. Nothing more. It feels like an old school flat in the realm of the old Nike Streak, New Balance RC5000, and the original Asics Piranha. Except, oh yeah, it’ll set you back $250. Okay, so maybe it’s not entirely my sort of shoe. But in trying the Fast Pro over a couple different workouts, including some mile repeats that took me over the track, grass, gravel, and paved asphalt - I’m pretty convinced this is the flat to buy, if you can find it in the budget. Dave: I’m a tad late to the party here. I received the Fast Pro a few months ago, but was dealing with a meniscus issue at the time and had a marathon up in NorCal to jog in prep for Ultra training. A shoe like this was out of the question at the time. Well, fast forward to now and I’m about 90% and feeling pretty solid (knock on wood) - - I’m straight up giddy about the Fast Pro. I was able to test the Run Fast ($140 version) a few months ago and that shoe was an absolute delight! It’s a speedster for sure and not only did I do a majority of my workouts in it, I also ran some general aerobic mileage days, too! It’s just so dang smooth! The Fast Pro is your old school racing flat. Something the run industry has steered away from in these last bunch of years. Everything is about max cush, or the marathon today and shoes like this are rarely produced still or hell, there’s never any marketing. Well, Reebok is bringing back the track flat, the short distance racer and well frankly, speed. It’s called the Fast Pro. Sam: The Pro fits me true to size but this for sure is a race shoe type fit. The single layer, engineered mesh and the few overlays provide all the support. Needless to say they are super breathable. Sizing up for wider feet likely won't work in this shoe due to the upper being so minimal and only effective if the fit is snug. The mesh is light, incredibly airy yet also quite dense. My first run out of the box I wore them barefoot. A mistake as I got some irritation on top of one big toe. They needed to stretch out a bit and I noticed I did not pull the very, very thin suede leather tongue all the way up. My next run, the race, I used very light socks. I had no issues whatsoever as the shoe had stretched. At a next race I would wear slightly thicker socks. The heel hold is a bit on the loose side as the heel counter is quite minimal and the rear padding softer and thin. As pace picks up, their intended purpose, and one gets off the heels, the fit overall dials in. Derek: The fit is true to size for me. If anything, it is a smidge long at the toes when running sockless. The last is on the narrow side, similar to the Nike Zoom Streak LT or Saucony Endorphin Racer, but the very unstructured upper allows for a comfortable wrap and hold even for my relatively low and wide arches. For reference, I have no fit issues with the Nike Streak LT or Streak 6 but the Pegasus 35 and Epic React uppers are too snug at the arch for me. I had no fit issues right out of the box and my very first run was done sockless. My second run was in my usual training socks, and in both instances, the shoes just disappeared on my feet and I never once thought about them during the runs. Michael: Like Derek, I got an immediate reminder of the Streak LT when cinching up the upper. It’s narrow, but not oppressive, and I don’t think I’d want to have much lateral movement in a flat, anyway - especially for road races. I wore socks in them for both workouts so far, but would ideally race without them, if I can give the Fast Pro enough of a test beforehand so that the uppers don’t end up red. Based on the comfort, I can’t imagine that being an issue. I also found 8.5 true to size, and in-line with most racing flats (I haven’t tried any other Reebok trainers of late, so I can’t compare it to their current lineup). Sam: The midsole is a combination of an upper yellow EVA layer which stabilizes and the Floatride Foam,which is the same general material used in Nike's Zoom X in the Vapor Fly and new Pegasus Turbo. Shockingly, there is plenty of cushion here and while firm, forgiving cushion with a touch of that distinctive PEBA spring. I was particularly struck by the forefoot feel. Stable with some dense rebound there is plenty of cushion up front for me for up to a half. The heel is a bit of a different story.. As there is only 16.5mm of stack, and a 4 mm drop, the heel does feel low, and quite firm but for the material there-not much when one thinks even most race shoes have 20mm plus and the Vapor Fly close to 30 mm. Mind you, I only ran them twice before sending to Michael Ellenberger for further testing. He is a 30:21 10K runner and 1:12 half so a shoe designed for him! Update: I have a new pair of the Pro. So I "jogged" them to break them in for an upcoming 4 mile race, a progression from just under 11 minute miles down to around 9:20 minute miles. I was very surprised how well cushioned they were at slow paces, a better cushioned feel at the heel than run faster. with the forefoot feeling about the same. I am assuming that faster paces with stronger downward forces with my mostly heel landing takes the compression down closer to the ground. In both cases the sense of snappy rebound is notable. It is kind of shocking that 16.5mm of rear stack feels so good at slow paces with of course a firmer ride than a trainer but very little sense of hard shock that most shoes under 8 oz have. I do note that once run twice the flex of each shoe is different, one having a forward at the toe flex point with the other further back, Not sure if this is a potential defect or that given I have a somewhat twisted right leg and different toe off pattern if the shoe has actually adapted to my gait and pattern. The difference in flex is not noticeable on the run. Derek: I am now thoroughly convinced that the firmer EVA topsole in the Run and Run Fast take away from what is otherwise a very lively energetic ride from the white PEBA foam. With much less green EVA foam in the Run Fast Pro, the springy characteristics of the PEBA foam really come to the fore, and it's apparent from the very first step you take walking around in the shoes. It's not mind-blowing like those first few steps in the Vaporfly, but it's pretty darn close, and you would never believe the low stack and weight of the shoes from walking around in them. Obviously for a low drop shoe like this, you are going to get the best ride when you land more towards the forefoot. The heel does feel low, and rightly so, but it is by no means exceedingly harsh, especially compared to other racers weighing 50-90% heavier e.g. ASICS Tartherzeal or Nike Streak 6. When I got a bit tired and landed heel first during my intervals, I was still pleasantly surprised by some decent cushioning back there. In terms of flexibility, I would say this shoe lands somewhere in the middle. Nothing crazy like a Nike Free, but definitely more flexible than most other racing flats in the sub 7oz range. I would say the flex is closest to the Nike Zoom Streak 6, which does flex pretty easily but snaps back quite well. Note that there is no torsion system in the Run Fast Pro, and the long axis rigidity relies purely on the stiffness of the foam. In that regard, I think Reebok hit the sweet spot in terms of choosing the right stack to achieve this amount of flex. Michael: I haven’t worn the Vaporfly 4%, which Reebok specifically targets in its advertising of this shoe, so I can’t draw a comparison there. But relative to other racing flats in my arsenal - the Nike Flyknit Racer, Nike Streak LT, Nike Flyknit Streak, Adidas Adios - this has one of the softest feeling, springiest returns I’ve worn. It’s almost jarring, coming from something like the Flyknit Racer (the shoe I ran my past couple PRs in), whose Phylon cushioning paired with a Zoom Air unit and the signature “waffle” outsole really don’t make it feel like a bouncy ride. It’s a racing flat because it’s light, and for almost no other reason. Here, I think the Run Pro again exceeds the competition - it’s light, of course, but also cushioned and reasonably supportive, as flats go. Dave: EVA, combined with Floatrid PEBAX foam off the forefoot? Oh, baby. She’s a missile. I’m getting old. My legs are beat up. I don’t handle fast stuff too well anymore and I’m transitioning over to Ultra. Many years of 100+ mile weeks and overtraining have caught up. Well, I slid the Fast Pro on and I enjoy going fast again. Even using this shoe to warm up before a workout (I don’t always do this, but wanted to see all aspects of the shoe) - - it was uber smooth. Where does it shine? Well duh, going fast! The transition rate is so quick, you are up on your forefoot before you know it. When there, the PEBAX just propels you forefoot, so efficiently and so quickly that you rarely notice the almost minimal feel and lack of substance under foot. I was skeptical thinking the Pro would beat the crap out of my legs, but the snap off the forefoot is so quick you rarely spend any time on the ground! Well, well done. Sam: Back to that outsole... I think it plays a huge role in both the cushion and a distinctly micro focused ground feel. You can really feel the ground and a very, very subtle sense of the hundreds of lugs individually or in small groups conforming to pressures in the gait cycle, stabilizing, and rebounding as then pressures applied from the lugs to the PEBA midsole are released. I think the combination of lugs embedded directly into the midsoles also reduces vibrations up the leg. It is a very distinct and unique feel. Looking very carefully I see a thin transparent plastic plate, glued to the midsole through which the lugs emerge. I am guessing it stabilizes them laterally and provides a bit of overall at the ground stability and where there is no plate as shown above some recouping and flex as the shoe flexes where there is no plate. And the grip from these firm TPU plastic lugs is fantastic. I tested them, as I do all shoes, over a section of concrete sidewalk with a thin sea sand layer. 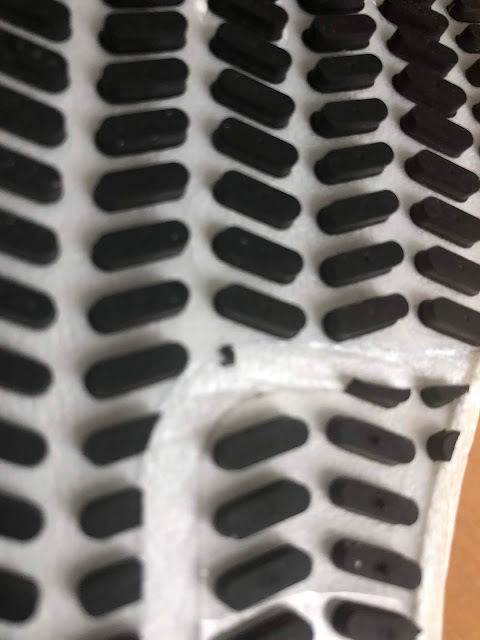 I expect the wear to be excellent as this isn't rubber but hard plastic in each lug, actually reminding me of the TPU forefoot strike plate nubs in the adios Boost 1 a great feature of that shoe and one that was very long lasting. The lug design of the Fast is similar but they are rubber and in a sheet glued to the midsole with a more continuous heel landing area and above the outsole on the lateral mid foot an EVA plate. Derek: I've used the shoes on dry and wet roads, as well as dry and damp track surfaces.so far the shoe has performed admirably on all counts. It is extremely stable, I think partly because of the great outsole grip, and partly because of the lower to ground ride. No complaints here from me. I think this is a sign that we do not always have to go with blown rubber to get a bouncy feel underfoot. Michael: I’d consider the outsole to be the weakest element, though I imagine it won’t become an issue for most people, given where this shoe will be used. On a track, on asphalt, on concrete, and even on fine crushed gravel, this felt like any other outsole - stable, grippy, and responsive. On areas where the path had been washed out or otherwise backfilled with decent, .5” diameter rocks… you felt like you were stepping, well, on rocks. Especially when trying to turn over on a mile repeat, this was a little concerning - and an element where, if I knew my race was to be on gravel or uneven surfaces, I may tip towards something like the Streak or Flyknit Racer (or, from the looks of the outsole, the Reebok Run Fast) before pulling out the Fast Pro. 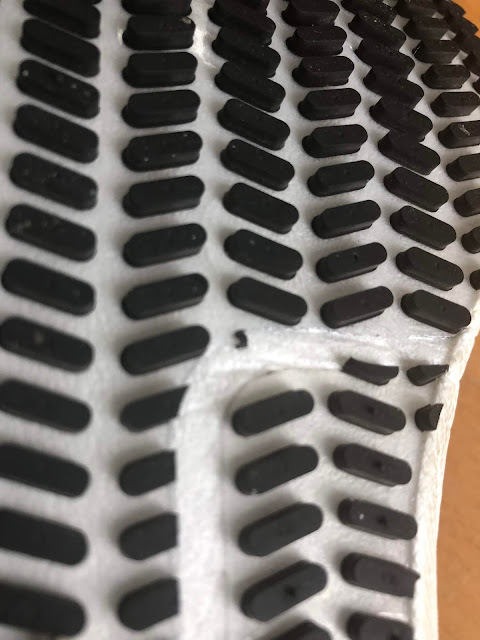 Dave: The outsole is unique. And props to Reebok for thinking differently in a run biz where a ton of companies copy one another and are struggling to find themselves. Like Sam mentions above, the lugs, mixed in with PEBA give this a repeated rebound action, mile after mile. Great grip on all surfaces and I felt confident with my biomechanics and foot strike everytime I’ve slid this shoe on. Sam: I can't ever recall a race flat with such a decisive yet at the same time forgiving ride. There is clearly not much under foot given the stack and sensations from the road are definitely felt but without any nasty pounding and vibration. They are impossibly light but with surprising substance and cushion. The forefoot feel and toe off is particularly note worthy. It is super stable and decisive yet without a firm mid foot plate such as found in the comparable weight Altra Vanish-R which only has a very low 12mm heel and 5 oz Nike Zoom Streak LT 4, the only shoes in its weight class at Running Warehouse here. I do wish for a few more millimeters of heel stack and a somewhat more substantial heel cup which would likely easily extend their range up to a half for me. A lighter, I am 165 lbs, faster runner with a more mid foot strike could easily run a half in them and likely beyond and should find the heel area just fine. Track runners on the border about wearing spikes could easily race all distances in them with the grip from the hundreds of mini lugs likely outstanding. The Fast Pro is a sub 4 oz shoe here with amazing substance for the minuscule weight. Is it worth $250? Readers must judge for themselves. I suspect it will last many miles and the technical achievement (most likely the injected outsole being the big factor) to achieve such a weight likely was not trivial with the result is an amazingly light and comfortable race shoe. The range of races and workouts possible is going to be broad with the Pro, from shorter road races for most, track workouts, even some XC but likely will not be as broad as for its $140 sibling the Fast which can easily also cross over into daily training. To end, I really regret passing my pair off to Michael for further testing. Going into my testing I was pretty sure the Pro would just be to little shoe for me and even painful, if fast, but not so! Derek: This is the lightest shoe I own. And that includes spikes! Looking back historically at the superlight racing flats like the Mizuno Universe, ASICS Piranha etc, I think the only shoe that ever came close to this level of cushioning was the Nike Mayfly, but even then it's one rung down in terms of cushioning and even weight. Most of the others just felt like a dead piece of rubber under your feet that really didn't do very much but transmit all the road shock up your joints. The biggest selling point with this shoe is the amount of bounce and cushioning they managed to pack into the shoe. It's essentially half the weight of the Vaporfly but maybe 60-70% of the cushioning! Like Sam I think the forefoot responsiveness is the main thing you notice. When you are running at race pace, the forefoot cushion just adds an extra little oomph into the toe off propulsion that belies the low stack. The overall ride is extremely smooth even at slower paces, though of course you will want to go fast in this shoe. The racing feel of the upper and featherlight weight just handle pace changes (e.g. In a fartlek) amazingly well, and really, it's only your own fitness holding you back. The only thing to be aware of is that a low drop shoe with no torsion system or plate, will tend to transition “under your own steam”, and there are no toe springs, rocker systems or carbon plates to help you here. Like Sam, I am more partial towards shoes with a more conventional 8-10mm drop, but in this case, as long as you are going at a fast clip, the low heel doesn't feel that noticeable. Having said that, I think a little more stack in the heel would get this shoe up into the half marathon category, without gaining too much weight. Update: Derek recently ran a 17:23 5K PR at the World Masters Games 7th in his Age Group. Michael: I’m glad Derek brought up the Nike Mayfly - while that shoe is long gone from the market (and was specifically designed to last 100K, anyway), that’s the shoe that the Reebok Floatride Fast Run Pro ultimately reminded me of. It’s springy, it’s damn comfortable, and holy heck it’s light. I’d pick this shoe over anything else I’ve tried in the recent past on weight alone, but to add that cushioning and comfort on top just sets it over the top. That is, until we get to the price. I obviously can’t tell you if it’s worth the $250 price of entry, but I imagine for most people it won’t be. To the Fast Pro’s credit - and to help justify the cost, certainly - the shoe does have some range. I’d be hesitant to recommend this for a marathon (though I may well try it), but any other distance is almost certainly a ‘go’ from me. Frankly, this is almost the perfect 5K/10K shoe, where I think the raw weight of the thing will get you to the finish faster than whatever propulsion system Nike’s baked into the Vaporfly. Over a longer distance, it may be a closer call - Nike certainly pushes the Vaporfly as a marathon shoe, and it’s weighted like one, but I don’t know that your legs will feel any worse after 26.2 in the Fast Pro relative to a Flyknit Racer or Streak LT3. Update: read Michael Mag Mile 10K Race Report here. He just set a post collegiate 10K PB in the Fast Pro! Dave: This is what the run biz was missing. This what I have been missing. It is an absolute missile that leaves you wanting more time in it, workout after workout. I tempoed in it, where it felt so so smooth. I did a hill repeat sesh in it, where it gave me so much bounding power uphill (as did the $140 Run Fast) I was clicking splits I haven’t seen in a long time. I also did a high output vo2 max session of 5 x 5 mins fast (5:35 for my washed up arse) with a 4 min float, plus 10 x 1 min hard/easy on tired legs. When my legs were tired from the vo2 max portion, I like to add on things to help turnover on tired legs, both in my training and with my athletes I coach worldwide. The shoe came in handy. My stride never lost its power during this workout I repeatedly found the forefoot stride after stride. Who’s the Fast Pro for? I don’t think it is for everyone. It has a narrow fit as a racer should. If you have a wider foot, I think you hay struggle with this shoe. It’s so paper thin I was worried I wouldn't be able to handle the lack of stack, but I leave every run wanting more of it! If you currently train in a racer, or have the biomechanics to handle speedier shoes, then the Fast Pro may be a great compliment to your collection. Perfect for varieties of workouts, and shines on the roads, hills and track. Max distance for me in this shoe would be about a 10K. Possibly a 10 miler. Yes, it’s $250, but I think that is what makes this unique. Could it be more like a $175 shoe, yes. But it is something special, it’s not mass produced and it keeps you hungry to train hard and chase your dreams. I couldn’t be more pleased at where Reebok is going as a brand and will for sure keep an eye on them. They are doing things right. -0.2 for price which sadly may limit runners trying this amazing shoe. -0.1 for high price point. Sam: This very close sibling is more shoe for sure yet still commendably light at 6.6 oz, so 2.4 oz more than the Pro. It weighs $100 less on the wallet as well. The ride is more cushioned and more stable, the forefoot feel not quite as lively and despite the light weight, the difference in weight between the two is noticeable. The Fast clearly has a greater range of utility from daily training to racing and is very easy on the legs but it is not quite the ultimate short distance racing machine the Pro is. Derek: I actually find the ride characteristics of both shoes to be quite different. The Fast for me has a more conventional feel, and a firmer more stable overall ride. It has very good vibration dampening, but for me lacks the lively springy feel we have all grown accustomed to from the top newer generation racers. The Pro on the other hand, has a very dynamic springy ride, with a lower to ground feel. The Fast would be more of a half-full marathon shoe, while the Pro would be more at home for shorter races, but I can easily see more efficient runners using the Pro all the way up to the full marathon distance. As a ballpark, I think anyone who can use the Nike Streak 6 for a full, will be able to handle the Pro for the same distance, and probably feel less beat up! Dave: I love both of these. I basically pull the Fast for longer stuff and even general cruiser aerobic miles. The Fast Pro gets the pull for the wicked fast short stuff or mid range 400m to mile reps at the oval office. It’s not really that one is better than the other for me, it’s just that they are used on different types of days. Sam: Different race shoes for different preferences and distances. The Pro is the classic race flat completely re engineered. The VaporFly is a super cushioned super dynamic, completely new concept. If you still want that low to the ground fast and tactile feel the Pro. For long race cushion with the ability to race short too the VaporFly. Derek: Different shoes for sure, but if ever you were looking for a “short course” version of the VaporFly, I think the Pro is the closest to the Vaporfly on the market at the moment. Similar dynamic ride under the forefoot, but with a little more ground feel for that snappy toe off. Of course, the Pro will lack the transitioning prowess of the Vaporfly since it has no embedded plate or torsion system. Derek: I know the LT4 is out but my LT3s just refuse to die. The LT3 is my go-to shoe for short intervals, and I've also used it for the odd 5k run on road, track and XC. I like it because the unstructured upper and the thin flexible and grippy outsole conspire to feel like an extension of your foot, and gives a very natural run feel that other minimalist shoes seem to not grasp. The Reebok Pro does all these with the added benefit of 50% less weight, and a much higher degree of cushioning. Of course, the price difference is significant, and it comes down to how much you want out of a pure racer. If money were no object, there is no question the Pro is the best racer not called the Vaporfly on the market right now. 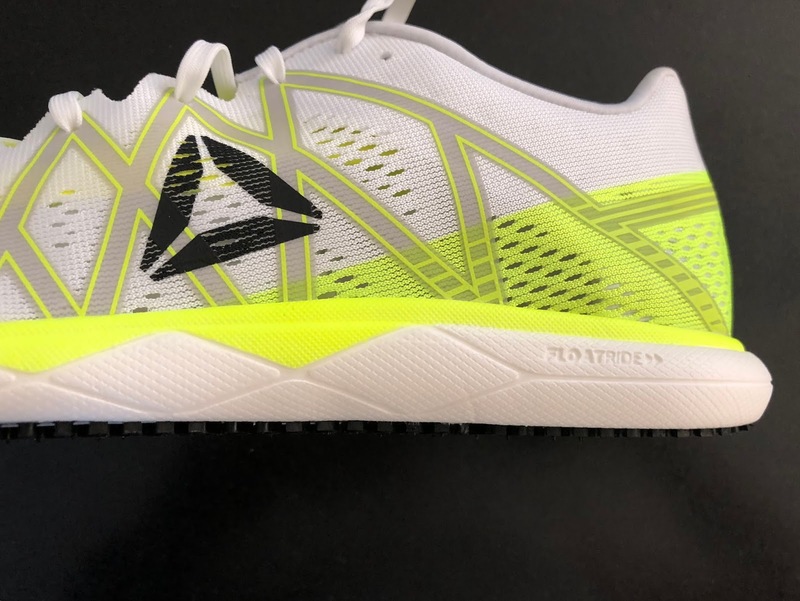 Michael: Both the LT2 and LT3 were well-serving flats for me in college, especially for longer tempo efforts or generally faster runs (the “LT” allegedly stands for “lightweight trainer,” though they never marketed the shoe that way. I’d take the Pro over either LT model, with the exception of high-school/collegiate runners looking for a cross-country workout or non-spike racer, in which case I think the LT models give a little bit better lockdown and certainly a better outsole for rougher terrain. For basically all other use cases, I’d go Pro and not look back. Dave: Both heavy hitters in my arsenal and the only other shoe I have given a perfect 10 to. I gotta give the nod to the Fast Pro here, because after running in it, it wants me to come back for more! The 1400v6 is a solid racer and workout shoe, and I use it bi-weekly, but it is a tad stiff. While is transitions quickly, it’s no where near as quick as the Fast Pro. I can take the 1400v6 up to a Half Mary, so it does have that going for it. Sam: While our reviewers loved the Zoom Streak 6, I did not. An overly firm shoe which I did not find much fun to run it weighs 2.4 oz more than the Pro. A 10K race in them, while in a fast time, left me trashed for days while I walked away none the worse for wear from my 5K in the Pro on a hot humid day. Derek: The Streak 6 was my 10k race shoe until the VaporFly came along and I liked it for the bounce you could get off the forefoot when you upped the pace, but yes it’s not a shoe you want to be in if the wheels come off and you start to tire. I find the Pro to have a similar forefoot bounce, and surprisingly better vibration dampening despite lower stack heights, and the cushioning extends all the way to the heel, unlike the Streak 6 which has very poor heel cushioning. Michael: I’ve only worn the Flyknit variant of the Streak 6 (“Flyknit Streak”) and really liked it, with a few quibbles. I used it as a trainer, for a time, and a generally go-to faster-running shoe afterwards. Besides some achilles irritation I got on runs of 10+ miles, I really didn’t have any problems with it, and I think if you want a trainer/workout hybrid, the Streak is a better bet. For a go-to racer or workout flat, the cushioning and weight of the Pro can’t be beat. Sam: With a more refined and more supportive upper and Boost Light the 1.5 oz heavier $180 Sub2 is not nearly as decisive and barely more cushioned although with slightly better vibration dampening despite having 4.5mm more heel stack and 2.5 mm more forefoot.I think it is held back by its single slab Continental rubber outsole which while durable has less snap and a more easy going almost trainer like very long flexing vibe. It just doesn't feel like it wants to run fast. In comparison to the Pro, it feels a bit lost as to its purpose not quite snappy enough for shorter races, not cushioned enough for longer. Derek: I liked the vibration dampening characteristics and the grip of the Sub2, but it seemed to lack the bounce we have come to expect from Boost, however little there is in the Sub2. The shoe ended up feeling a little dead on the road compared to e.g. the Takumi Sen Boost. By contrast, despite being 50% lighter than the Sub2, the Pro completely outshines the former, both in terms of cushioning and toe off responsiveness. Sure, the Pro costs $70 more, but would you rather pay more for something that definitely works, or less for something that just feels sort of okay? Sam: Similarities in toe off feel here due to the front outsole rubber and strike plate. The much much heavier adios has substantially more heel cushion. I raced many races from 5K to 20 miles in them and they have a wider range for me than the Pro but not the decisive super light fun of the Pro at shorter distances. The adios Boost 3 was considerably softer and less decisive up front. Michael Ellenberger is a rising third-year law student at Northwestern in Chicago, with an interest in patent and intellectual property law. Prior to law school, he competed collegiately at Washington University in St. Louis (10,000m PR of 30:21). He was the top Illinois finisher in the 2017 Boston Marathon (2:33:03, 82nd overall) and recently finished 5th at the North Shore Classic Half Marathon in a PR of 1:12:12. Michael is a gadget and running nerd. His pre-race breakfast is, and will always be, Pop-Tarts. The Pro was provided at no cost. The opinions herein are entirely the authors'. SHOP RUNNING WAREHOUSE FOR FLOATRIDE RUN FAST PRO! Hi Sam - great review! How does sizing for the Pro compare to Nike sizes? If I'm a 10.5 in the Epic React, Peg 35 and Peg Turbo, do you reckon I should go for 10.5 in the Run Fast Pro as well? If you're from EU take look on the exact heel-toe" on the size chart - there is minimal dfference comparing to other brands in my case new balance , saucony. Usually I'm ordering 44 eu which is 10 us, 44 in rebook is 10.5 us.